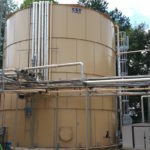 The wastewater industry is full of general rules of thumb and best practices, often ignored within these is selecting the right storage tank with the right coating for the application. As the term ‘wastewater’ represents a broad cross-section of constituents, waste stream makeup, compounds, origin and strength it is no wonder that the general rule of thumb is just that, too general. Wastewater streams vary widely, especially in the industrial sector, as do the options effective in their treatment. Just as careful selection of the right process and technology is a necessity to achieve successful (i.e., permit-driven) treatment results, so too is the tank in which the initial storage and eventual treatment process takes place. The success or failure of any tank is largely dependent on its coating. 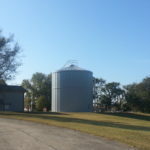 While there are generally two main albeit different types of steel storage tanks on the market today, welded steel and bolted steel, they are relational in they both rely on a steel substrate for structural integrity (steel sheets welded together, steel sheets bolted together) and a coating system (field-applied paint, factory applied glass or epoxy) in order to effectively store liquid. The storage and treatment of wastewater, in all of its variations and sources is some of the hardest liquid to store. The components that make up strong waste streams often produce heavy corrosion-causing conditions that challenge storage tanks of all types. The “right tank” in the wrong application carries monetary and operational consequences, commonly referred to as time & money. Welded steel tanks are the oldest of all storage tank designs, which includes ground storage tanks commonly used for wastewater treatment. The design of a welded steel tank includes the application of a field-applied coating, the success or failure of the coating is largely reliant on two things; the applicability of the coating (‘paint’) being used and most importantly the proper application of the coating. Even the best coating system will fail if not properly applied, field conditions often change quickly allowing environmental conditions to affect the application process. The true weakness in field-applied coating lies in the fact that they are carbon-based systems, meaning they can and will chalk, fade and eventually fail due to corrosion. Additionally, while there are various types of custom or heavy-duty coating systems available the costs associated with coatings themselves and the stringent nature of their application often make them too costly to consider. 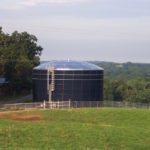 Bolted, powder-coated-epoxy-steel tanks are some of the most widely used in wastewater storage and treatment operations. Their low initial cost compared to field welded and bolted, glass-fused-to-steel tanks often give them an advantage. Additionally, bolted, powder-coated-epoxy-steel tanks are quick to erect and can be built on small sites with limited space around the tank in which to work. This is due to modular building techniques unique to bolted tank construction. As with all coated steel tanks, the bolted-powder-coated-epoxy-steel tank relies on its coating system to provide the protection against the harsh environment found in wastewater. While the powder-coat epoxy is a carbon-based, the advantage bolted-powder-coated-epoxy steel tanks have is in the actual application of the coating; bolted-powder-coated-epoxy-steel tanks are factory-coated, this allows ever-changing environmental factors that adversely affect field-applied coatings to be eliminated. The coating process is fully automated, using state-of-the-art robotic applicators and the latest in steel sheet preparation ensure the epoxy coating is evenly applied, in precise thicknesses and properly cured in order to achieve a robust coating system. This results in a ready-to-build product that is fully coated and ready for service once it is delivered to the site. 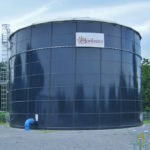 Bolted, glass-fused-to-steel tanks have become a viable and sought after technology for wastewater storage and treatment. Although higher in initial cost compared to bolted, powder-coated-epoxy-steel tanks, it is a truly unique product that uses a factory applied glass coating (porcelain enamel) to protect the steel against corrosion. The glass is “fused” to the steel, this “fusion” process is only achieved at > 1,500° F and produces an inert coating that is mechanically and chemically bonded to the steel. The result of this “fusion” is a coating system that is impermeable to most liquids, eliminates undercutting caused by corrosion, will not chalk, fade or rust and will never need recoating. Glass-fused-to-steel is more than twice as hard as any field-applied paint/coating system and has a bond rating 12.5 times stronger than factory-applied, powder-coat. Similar to the powder-coating process used on bolted epoxy tanks, the application of the glass coating is fully automated, using robotic spray guns and applicators that ensure consistent, uniform liquid glass coating is applied to every sheet. Glass-fused-to-steel tanks are erected using modular construction methods that allow the tank to be constructed on small sites with limited work space. This form of specialized construction utilizes lifting jacks, designed specifically for Aquastore® glass-fused-to-steel tanks provides safe, OSHA-friendly construction with quick and efficient erection time. Welded Steel: High capital cost, long range life with potential for high maintenance costs, dependent on skilled field craftsmanship (construction and coating). Bolted, Powder-Coated-Epoxy-Steel: Low capital cost, short to mid service life with recoating potential and eventual replacement, engineered product – manufactured sheet materials with factory-applied coating. Bolted, Glass-Fused-to-Steel: High capital cost, long service life with minimal maintenance required, engineered product – manufactured sheet materials with factory-applied coating. The reality in any and all of these tanks is they will require significant investment; time, money, resources, operational impact and will become another piece of the plant’s infrastructure. They also become another line item on the maintenance list that will affect the company’s bottom line in some capacity. The money will get spent on capital investment in the tank itself and over the life of the tank in scheduled/routine maintenance costs. The decision on where and how to spend that money will be affected by the technology chosen – a company will spend less in capital costs on a bolted, powder-coated-epoxy-steel tank but will eclipse that initial cost with maintenance (repair/recoating and eventual replacement) costs. Conversely, a company will spend more in capital costs on a bolted, glass-fused-to-steel tank but will achieve overall cost reduction in maintenance (minimal repair, no recoating or replacement) savings over the life of the tank. The improvement in the plant’s waste treatment process will provide peace of mind for regulatory compliance and a good name in the community, the storage tank used in that process is an integral part – both economically and operationally. Let Southeastern Tank, Inc. help you select the right tank with the right coating with the right technology for your waste treatment application.